We’re in the process of installing a new Local History Centre for Whitchurch. Working in collaboration with the Caldecott Library and the Whitchurch Heritage Centre the result will be a new look facility offering updated resources, advice and information. Assistance will be available over the two locations in the town for local and family history enquirers on four afternoons in the week. There will be new books, maps, digital resources, bookcases and even a small display of museum objects. We’re going to need new volunteers to run the advice sessions in the library: if you like local and family history and enjoy dealing with people this could be just the role for you! Do get in touch if so (john.benson@shropshire.gov.uk/ 01743 255377). 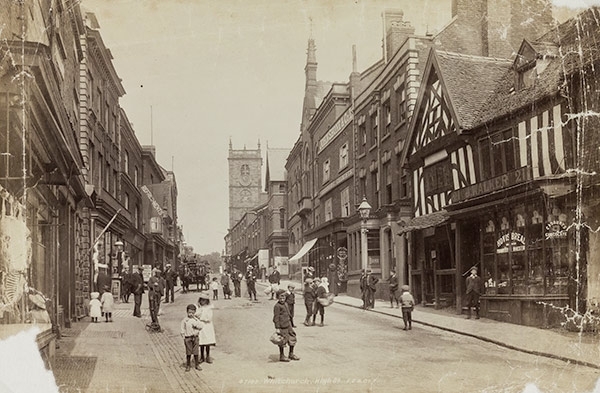 Back in October our thoughts were focussed on the town when we held a Whitchurch History Day, jointly organised with the Friends of the Shropshire Archives. We learned a lot about the town’s history and were entertained by the songs of Bill Webb and his colleagues. We discovered much about the town’s canals, about William Egerton, Rector of Whitchurch for many years, about cheese and turret clocks. There were tours of the parish church and a town centre ’pavement safari’. We are very grateful for the generous assistance of Whitchurch Heritage Centre, Shropshire Libraries, Bill Webb, Russ and Gill Symons, Peter Brown, Jim Gosling and Pauline Stokes.